1-3 Piezo Composites have become the material of choice for many high performance ultrasound transducers since they were invented by R.E. Newnham and L.E. Cross in the late 1970's . A variety of piezo composite materials can be made by combining piezo ceramic elements with a passive polymer such as epoxy or active polymer. 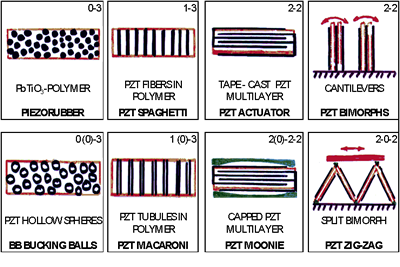 Piezo composites are classified according to their connectivity (such as 2-2, 1-3, 0-3 etc.,). Connectivity is defined as the number of dimensions through which the material is continuous. It is conventional for the first digit to refer to the piezoelectrically active phase. Prof. Newnham defined the family of interconnectivity of piezo electric composites as shown in one of his drawn pictures below. Today the piezo composites used in ultrasound transducers on the market are typically of the 1-3 and 2-2 connectivity. 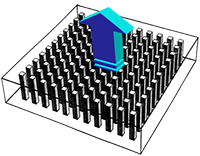 Disadvantages of piezo composites over bulk piezo ceramic components are generally the higher costs and the often limited temperature operating range. The biggest single market for the 1-3 piezo composite is the medical diagnostic ultrasound market which utilizes more 1-3 piezo composites than the other markets combined. Current medical ultrasound imaging systems would be not possible without the advancements in 1-3 piezo composites. Smart Material manufactures and distributes piezo composite materials with 2-2 connectivity and 1-3 connectivity. As one of the few companies worldwide, Smart Material is utilizing different manufacturing technologies for the production of 1-3 Composites. Utilizing different manufacturing technologies for 1-3 piezo composites allows Smart Material to provide 1-3 composites for frequencies ranging from 80kHz to 15MHz, with fill factor ranging from 15% to 80% and sizes up to 100mm by 100mm (4 inches by 4 inches).